The crisis of the Santa Barbara offshore oil spill in 1969 led to the passage of radically new environmental laws that made the United States an international leader in environmental protection at the time. Since then, environmental regulation has proved detrimental to both industrial and environmental performance. It contributed to a deepening confrontation between environmental and industrial groups, a rift which spread to other areas of politics and society. This book traces the origin of the current conflict and carefully analyzes current environmental and resource policy. Other advanced nations, especially in the EU, evolved more sophisticated and cooperative policies. These have led to high environmental quality and have permitted the EU to lead in global reduction of greenhouse gas emissions. Moreover, the environmental regulatory policies have fostered robust industrial and fiscal performance. Americans know something has gone wrong in the U.S. 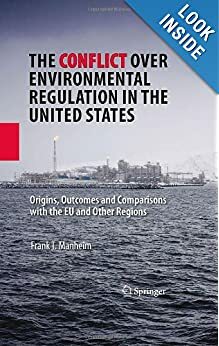 The book’s candid comparison of U.S. and EU policies yields fresh perspectives on sources of U.S. dilemmas in energy policy, Congressional lawmaking, and other areas of concern. Manheim, F. T. “A Brief History of United States Forest Management Policy.” Forestry. Forest, and Wood Technology of the Ukraine, edited by V. Dudok, V. Lentiakov & L. Myklash. Lviv, Ukraine: National University of Forestry and Wood Technology of the Ukraine, 36 (2010): 7. Manheim, F. T. (2010 ). “The other side of the coin: basic research in U.S. universities.” Elements (International Magazine of Mineralogy, Geochemistry, and Petrology), 6, no. 5 (2010): 276. Manheim, F. T. “A necessary critique of Science.” Comment on Malcom M. Crowe “The Challenge for the Obama Administration Science Team” (Issues, Spring 2009) FORUM, Issues in Science and Technology, June 22, 2009. Manheim, F. T. 2008. “Talk Without Yelling.” Review of “Earth: The Sequel. The Race to Reinvent Energy and Stop Global Warming,” by Fred Krupp and Miriam Horn. New York, Norton, 2008, 287 p. Science Magazine 322. (5900):377. Manheim, F.T. U.S. A new look at mining and the environment: Finding common ground: Geotimes. April (2006): 18-22. Manheim, F.T. U.S. Offshore Oil Industry: New perspectives on an old conflict: Geotimes. December (2006): 26-28. Manheim, F.T. “Review of ‘Climate change, climate science, and economics: prospects for an alternative energy future’ by Kooten, G. Cornelis van.” Springer, 2013, Choice Magazine. Manheim, F.T. Review of ‘Life in Europe under climate change’ by Joseph Alcamo and Jørgen E. Olesen.” Wiley-Blackwell, 2012.Choice Magazine, Jan. 2013. Manheim, F.T. “Review of ‘Ecological engineering design: restoring and conserving ecosystem services’ by Matlock, Marty D. and Robert A. Morgan.” Wiley, 2011, Choice Magazine. Manheim, F.T. “Review of ‘Global warming gridlock: creating more effective strategies for protecting the planet’.by Victor, David G.” Cambridge, 2011, Choice Magazine. Manheim, F.T. “Review of ‘Toward sustainable communities: transition and transformations in environmental policy,’ edited by Daniel A. Mazmanian and Michael E. Kraft.” 2nd ed. MIT, 2009, Choice Magazine. Manheim, F.T. “Review of ‘Climate change: observed impacts on planet Earth,’ edited by Trevor M. Letcher.” Elsevier, 2009, Choice Magazine. Manheim, F.T. “Review of ‘Energy,’ by Dukert, Joseph M. Greenwood” 2009. 217p index, Choice Magazine. Manheim, F.T. “Review of ‘Global climate change and the road to extinction: the legal and planning response,’ by James A. Kushner” Carolina Academic, 2009, Choice Magazine. Manheim, F.T. “Review of ‘The long thaw: how humans are changing the next 100,000 years of Earth’s climate,’ by David Archer” Princeton, 2009, Choice Magazine. Manheim, F.T. “Review of ‘Turning down the heat: the politics of climate policy in affluent democracies,’ edited by Hugh Compston and Ian Bailey.” Palgrave Macmillan, 2008, Choice Magazine. Manheim, F. T., and J. M. Dudik. “Assessing The Effectiveness Of U.S. Forest Policies And Management Through International Comparisons.” Poster presentation and manuscript, Annual Conference of the Midwest Political Science Association. Chicago IL, 2010. Manheim, F. T., and C. L. McNeely. “A Different Focus on African American Education: Legacies of Institutional Excellence.” 35th Annual Meeting of the Social Science History Association. Chicago IL, 2010. Manheim, F. T. “A Tale of Two Chemistry Departments – American and Swedish.” Poster prepared for Transatlantic Forum for Science, Innovation, and Higher Education, Carnegie Institution for Science, Washington D.C. October 19, 2010 (Sponsored by the Norwegian Research Council and Norwegian Academy of Science and Letters). Manheim, F.T. “Global Climate Change.” Power Point slide show prepared for Sigma Xi booth (125) at the USA Science & Engineering Festival, Washington Mall, October 23-24, 2010. Manheim, F.T. Book presentation sponsored by SPP Alumni Association: The Conflict over Environmental Regulation in the United States, 321 p. Springer 2009 (jointly with Prof. Ann Baker) February 24, 2010, Arlington Campus, George Mason University. Public presentation at Ballston Cafe Scientifique in Arlington, Virginia on March 2, 2010. Manheim, F.T. Talk on “The Conflict over Environmental Regulation in the United States.” George Mason University, Arlington Campus, Arlington, VA, February 24, 2010. Manheim, F.T. “Environmental Volunteerism.” Midwest Political Science Association Annual Conference, Panel Discussion (49-8), Chicago IL, April 4, 2009. Manheim, F.T. A new curricular approach to environmental policy. National Association of Schools of Public Affairs and Administration (NASPAA), Panel Discussion, Charleston SC., Oct. 18, 2008.